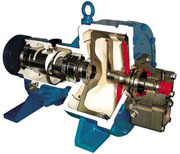 Roto-jet pump is a high pressure, high effciency pump having a unique design concept that pump case rotates. Roto-jet has only two basic working parts... a rotating case and a stationary pitot tube collector arm within the rotor. Liquid enters the intake manifold and passes into the rotating case where its velocity is increased. 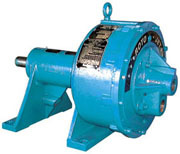 Centrifugal force causes the liquid to enter the rotor under pressure. The velocity energy of the liquid in the rotor is converted into additional pressure energy as it jets into the specially designed pitot tube. The liquid flows through the collector arm and into the discharge manifold. High effciency saves electric cost. 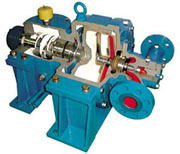 Simplicity of pump construction eliminates maintenance. No close clearance makes performance stable and reliable. Less contact surface make high mechanical reliable. Pulsation free pressure and flow.